It's almost Halloween, which is a favorite holiday of mine. I always had the best Halloweens as a kid complete with amazing costumes my mom would sew. Throughout college I made my costumes each year, because store bought just didn't live up to my expectations. However, I haven't had a Halloween house party to go to in awhile, so I have let my celebrating slide a little bit. 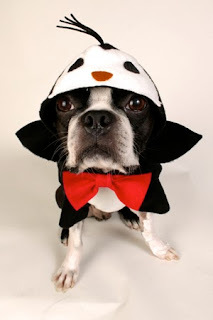 This year I thought it would be nice to bring back some of the fun and get Elton a costume. I have found the perfect costume, but I just can't decide if Ryno would be up for it. He doesn't support the practice of clothes on dogs. If anyone else is looking for a small dog costume, I think the costumes All-Mighty is selling this year are adorable. Personally, I love the penguin! They also have a lamb and a pig if that is more your style.